First English offers a free community meal every Monday night in its social hall from 5 to 6 PM. Food is served to all who wish to eat for free and without constraints. Meals are prepared and served by a crews assembled for a participating church, non-profit group, and local businesses in Butler to make sure that everyone in our community has enough to eat! 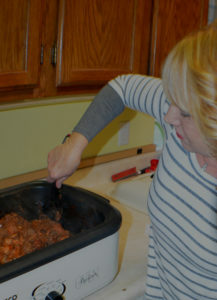 Monday night meals are prepared and served by teams of servants from First English, from our sister congregation, Christ Community United Methodist Church, and from other non-profit groups. Attending and serving community dinners has been an important way that we get to know our neighbors and one another. Do you have questions about community dinner? Do you have food to donate? Would you like to participate in serving? Please call the church office at 724-283-2378. 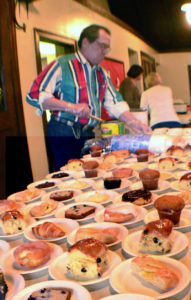 Meals are prepared by crews from participating churches. Here a group from Grace@Calvary pauses before serving.